It is important to understand the meaning of faith and reason and their impact on our life. Every individual has two personalities. The personality of religious faith with its practices is acquired from a majority of customized Madrasa-based education, where a few basic tenets of Islam are taught. Beyond this it has not probed to the level of learning. The personality of logical reasoning is acquired from modern education in schools, colleges, universities, research foundation etc. Logic, reasoning and scientific verification form he backbone of this system. This appeals to the mind because it leads to results and brings effects, as it is based on more concrete and scientific approach. It is generally misunderstood that there is an antagonism between reason and faith. When religious faith is not explained in a larger perspective and many of these unexplained questions remain vague in the mind of an individual. Many educated people think that religion demands unreasonable and blind belief. This is not true in Islam. The modern system of education is based on scientific principles. It uses logic, reason, and experimentation to gain knowledge. Many think reason and faith do not go together. If he practices religion, he thinks he must forego modern science. If he suffers from this delusion, he may experience mental tension. In the extreme form, such tension can even cause a neurosis. We must understand that the true nature of religious belief in Islam is based on intelligent faith. This faith grows from observation, reflection, and contemplation of nature and what is all around us. The Holy Quran encourages a rational approach to every problem. Early Muslim history is to record to this fact. 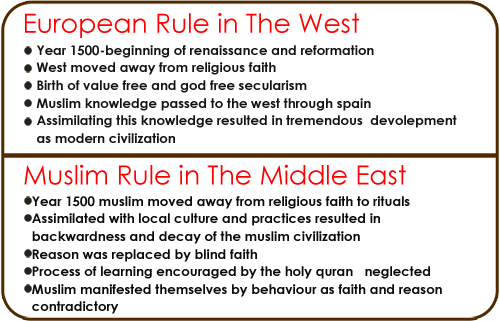 While the civilization in Europe was in dark ages, rational and scientific thinking and ideas were predominating in Muslim Countries. This knowledge later on passed to the west through Spain and Sicily. This was the real foundation of the developed west. 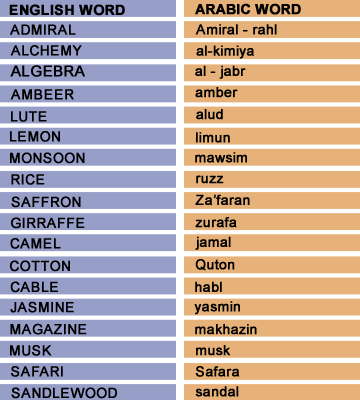 As a result we can see many of the English words derived from the Arabic language. Eg. According to Peter Drucker "Knowledge is the distinct resource for business, economics and human development." In developed countries knowledge workers are the new riches on the dawn of the millennium. Next to ALLAH, the most common word used in the Holy Quran, is ILM, i.e. Knowledge. The first five verses of the Holy Quran revealed to Prophet Mohammed (PBUH) highlights us to read, write and gain knowledge. We can find a number of traditions of Prophet Mohammed (PBUH) signifying the importance of knowledge. The Arabs were in a barbaric and uncivilized culture until the advent of Prophet Mohammed (PBUH). The advent of Islam ushered a glorious cultural renaissance to the Arabian Peninsula and the Arabs reached an exalted position, both in administration and knowledge. During the Islamic era, from 7th to 14th century, knowledge was held supreme in all spheres. That is how the Muslims made significant progress in the field of Astronomy,Mathematics, Physics, Medicine etc. The Arabs were the masters in Mathematics. They were an authority on Astronomy. The Muslims were the first to build an astronomical observatory as a scientific institution - the observatory of Maraghah in Persia was established by Al Tusi. The first great Muslim Mathematician, Al Khwarazmi, was the author of the first treatise on Algebra. In Physics, it was Qutb Al Din who gave the first explanation of the rainbow. The greatest of all Muslim physicians, Ibn Sina, was called 'the Prince of Physicians" in the west. He synthesised Islamic Medicine as a masterpiece, Al Qanun Fi'ltibb (the cannon of medicine). The Muslims deviated from the original teachings of Islam (Quran & Sunnah) and assimilated to local belief & practices. 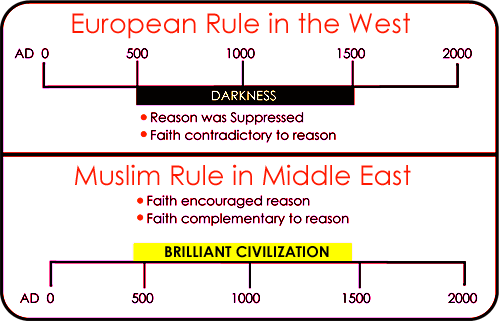 As a result Muslims depicted themselves backward contrary to the original civilizations seen in Muslim history. We can attain faith through a process of rational thinking. In the beginning, there is doubt. Sometimes we do not understand the cause of a phenomenon. But we can observe the effect. The hidden connection between cause and effect is truth. When we understand the truth which links cause and effect, realization sets in. Doubts get cleared. With growing awareness, faith dawns on us. So we must give up this false dichotomy between reason and faith. This is the Second Principle of successful Islamic living. In Islam reason is a part of faith. In Islamic words this can be put together as ILM+IMAN.